We hope you will share your thoughts with us. Here are some comments we’ve received. Having read over the “Apology” pamphlet, I definitely want my name to be added as a signer of the Statement. Racial Justice Rising deserves much credit for working to increase public awareness of the need for racial healing, including reparations. Thank you for giving me the chance to add my name to your Statement. A wonderful presentation and celebration of your many years of dedication and persistence. Much gratitude for all your endeavors and the possibilities for the future. I found the presentation last weekend to be totally engaging, informative and it made me proud to be a supporter of the work that you do. I left feeling very energized by the entire experience and thank you all heartily. Thank you for the excellent and important work you are doing to end racism and heal our country. I would like to be a signer on the apology. — W.R. I think the work you do is authentic and remarkable. It is an honor to be a part of it. This talk was really mind-opening. I have a lot to think about. I’m inspired to share this information with my peers and professors. I think the work you all are doing is making a deeply significant contribution to our community. keep it up! every program you have done has moved me, inspired me, and made me proud of our community grappling with such challenging issues. — S.B. Racial Justice Rising Saturday morning gatherings and the presentations themselves have invariably brought me to tears (and action). Thank you for all that you do in service. — C.W. Such great work! Thank you. This shines so many lights into the community and into our hearts. We loved helping out and would gladly do so again. Great presentations from each speaker. All were thoughtful, each had their own style and approach, and I both learned a lot and was given a lot of food for thought. Thanks so much, and I hope you do a program like this again. — G.A. In the rush and crush of busy life, your e-newsletters ALWAYS make me stop and give thanks! — E.M. Thank you for providing this opportunity to explore racial privilege. So valuable and essential to delve into white privilege and provide opportunities to be proactive rather than isolate and only feel guilty about the racial reality in this country. Just to let you know I really appreciated the list of links in your newsletter and am circulating it to some friends locally. — J.E. I have been following your work.. and the difficult journey that it has been. I greatly appreciate what you have and continue to do in Franklin County. with deep respect — P.L. I will post a link on my FaceBook page and tell others of your project. I hope the idea will catch on, and I truly believe it’s up to us European heritage folks to teach each other, and take some steps towards reconciliation. Thank you for doing this. – R.H.
– Facilitator held the space really well. Very grounded, clear, knowledgeable.- Style was different from what I’m used to and very effective- Amazing variety. Global, inspiring….Offered new ways of understanding universal truths.- Very clear about what the truth is behind racism or racism in general.- I remembered that learning our history is liberating and healing.- I have much to learn and was encouraged to examine/reimagine my default positions.- I enjoy the presenters opinions. Its is refreshing. And his desire to discuss, not just dominate.- Humor! You had us laughing! Provocative subjects, active style of presenting.- The presenter is a provocative thinker whose ideas have taken root in my heart.- As a white person how little I know about Black culture. This is an example of my white privilege that I am not proud of. Still supporting all you do for anti-racism and our common humanity. — S.C. I am honored to be part of an organization that are doing wonderful things and bringing awareness to communities. Thus, we are all in this together. — N.H. Please take me off your e-mailings list. Racial justice is more important than ever, but I don’t believe in the idea of ‘apologizing for slavery.’ I believe apologizing that is so far removed from the atrocity reinforces the atrocity and the victim conciousness. Where/when does start and stop apologizing? Action, not self-indulgent apologizing. — J.B. I would like to add my signature to the mass apology for slavery. I am taking a commitment to educate and hold accountable my white peers in day to day life on white privilege and racism, and encourage them to participate in anti-racist actions such as protests. I also will try to participate in any protests which welcome white allies that I’m able to get to. — S.R. I am going to put your quote in my collection of words that make an impact. Keep doing what you are doing. — M.S.R. Its a little late for apologies and definitely not a time for reparations…. Why doesn’t your stupid group do something more useful with its time? Perhaps get jobs, contribute to society, and get over your silly white guilt. — J.N. – Presentation superb! Hit depth of emotions.- Everyone respected one another- Presenter was brilliant and inspiring. Should never stop doing what she’s doing because it will lead to something great…. I liked the range of emotion and tone… She is gifted and the visuals help it sink in more profoundly.- I loved the talk back and partner work.- The presenter was calm, passionate, professional, responsive to audience questions and comments, highly skilled, and extremely engaging. I read about people like you, it too me 63 years to meet folks like you. — S.S.A. I was very moved, very impressed by what you’re doing with Mass Slavery Apology and your other, related work to address racism and white privilege. Thank you for doing it. — R.K. Thank you all so much for the work you do that I hold to be so special. And for welcoming me to your Community. — M.H. It’s such a pleasure to do this work with such committed and principled people that can also pull together a room full of vibrant, thoughtful, engaged folks. — M.M. Thank you deeply deeply. I join you unwaveringly and with deep grief for all that this represents. — A.N. Thank you so much for the opportunity to present to you all. It was an honor and a privilege… I really appreciate the work you are doing so we can heal from the impact racism has had …. I hope to continue the journey with you all. — D.M. Your newsletters… have served to inspire my continue work on eliminating racism. I am hopeful to meet with you and others from your group to continue developing ongoing coalitions to support our mutual work. — B.L. You do awesome work. I appreciate learning about your work while I’m out here…. Take care and keep keeping on!! Best and in community as we tackle this tough and important topic that is massive and needing our attention and work!! — H.F. This is quite a complete and wonderful statement. Feeling proud and grateful to this small group of good people in western Mass. — P.G. I have greatly appreciated Mass Slavery Apology’s clear focus on African Americans and African American history and restorative justice. I am concerned about African Americans’ issues being overwhelmed by the huge activism occurring now regarding Latin Americans as well as increased activism on the part of Indigenous peoples from North America. Of course the issues overlap and all need to be addressed. Could you please comment on this observation of mine? — N.D. I really enjoy the newsletter. I especially appreciate your finding and highlighting articles. Usually I have not been aware of the articles you point to, so it’s really great to have them come through my email via you newsletter. Also, just seeing all the events and activity that’s going on is very affirming. — J.H. I would like to add my name to the list of signatures. While I wholly disagree with slavery and am unaware that any of my ancestors contributed to slavery, I can’t ignore the past actions of generations before me. — A.H.
Great collection of resources — very thought-provoking, expansive, and deep — Thank You! — J.A. I love the work that your group does, and the newsletter is an invaluable resource. (Your) workshop inspired me to take action in a meaningful way in my work life! Thank you for being a part of that inspiration. — E.W. Thank you for not underestimating the amount of complacency people have over past issues. There is still the same branding and the same bigotry under a condition of silence which makes the world a colder place. I live in NZ and we have had an outbreak of Nazi youth activities…. — D.P. Blacks aren’t the only ones who have been enslaved in recent history. Have you done anything to acknowledge the tens of thousands of Irishman that Oliver Cromwell and others sold into slavery in Barbados and other Caribbean islands in the 17th century? Many descendents of these people live in the U.S. Blacks with Irish surnames are much more likely to have Irish blood than they are to have been descendents of slaves who were once owned by Irishman. I am white. My people came to this country after slavery was abolished. Do you think I should apologize? Why do you think you should? — E.O. I came across your site today, which you have to be congratulated on. The one surprise I had was that I expected the signatures to be in the millions and was shocked to see the amount. Good luck in your efforts. — R.W. With deep gratitude for this work — your words speak for my heart. — S.J. May we continue to share and celebrate all the important social justice work that goes on. — J.A. I believe that the racial divide in America will continue until our Nation begins the process of “repentance”, resolution, which will open the door for forgiveness. I think the CHURCH has a great personal responsibility in this effort and should lead the charge. God Bless. — A.R. God bless you and MassSlaveryApology.org. I so totally look forward to further communications and collaborations! — R.B. It is truly nice to see that a group of people are finally acknowledging the modern-day effects of this crime against humanity. I am a 35 year old man of color and my struggle truly highlights the socioeconomic divide in this country as caused by slavery. — Q.N. Thanks Mass Slavery apology, for this rich resource and for your good work in the world! — M.L. And thank you for your Mass Slavery Apology emails. I mostly don’t take the time to read mass mailings of this type, but I have to admit I am very glad to have scanned yours. Thank you so much! — P.M. I don’t often get to meet people who have subjected themselves to such rigorous introspection. Thank you! — W.S. Thanks for understanding and speaking out about white privilege and the effects it has on people of color. I appreciate your voice. — B.D.R. Before I travel, I look up my destination’s demographics and history with regards to slavery. Mostly out of curiousity but also because I feel it’s important to get an idea of the possible attitudes I may face as a person of African descent. I’m having a hard time articulating how electrifying I found the apology on your site. It was all well written, comprehensive, profound and most of all unexpected. Thank you for showing a hidden consideration and thoughtfullness that the oppressing class usually does not bother exersizing let alone expounding on in a public forum. A New Yorker by birth, now a Mass convert. — N.A. I so deeply appreciate your efforts to help “whites” primarily of European descent, to take responsibility for the effects of slavery past and present. I wonder if you have asked descendents of former slaves to read this document to learn if it addresses issues that are truly important to themselves. — W.R.
Congratulations and thank you. you are a rare and committed human being. I am very, very proud of you and the work of your partners. you inspire me.… You are doing such important work. Please know that your long hours of thought, travel, discussions, meetings, writing, editing etc. will change our world. — R.W. Thank you, Three Sisters! I would like to hear such apologies … I could at least feel some modicum of respect for the U.S. Government if such an apology was given to African Americans and also to people indigenous to Turtle Island. …By the way, I am Mohawk/Blackfoot/Seneca Indian…the U.S. Government owes US a big apology for the over five centuries of genocide that are still continuing. But an apology is not sufficient…just more words without substance unless they are backed up with real willingness to transform our Turtle Island into a truly civilized place to live on. But I would like to hear these apologies as at least a beginning. — S.D.C. Please add my name to the signature list…I sign with the meditative blessings of my nearest ancestors over the past three generations (beyond that I am still learning how to communicate, I am praying they are willing as well to add to the energy of intent to heal the wrongs done, the actions taken out of fear/ignorance/arrogance). In deepest gratitude for your work over the past 11 years and the years to come, — A.E.N. Deep appreciation for all your work to create this statement of apology. With love and gratitude, in solidarity, — Y.N. Please add our names to the beautiful, balanced apology you have written to Americans of African descent — and so educational to Americans of white descent. — J. & S. V.R. I’m so very proud of what you are doing. I am the widow of a black man…I am very much in favor of “cleaning” this horrible blot on the USA and its white citizens. It is way overdue. However, as I continued to read to the end it came to my attention that at the beginning you, rightly so, you included the native people but completely left them out at the end. One wrong is not any less than another wrong. Both of these peoples have been treated and used wretchedly, for which we must reparation. With the help of God it can be done. Thank you for the opportunity to speak out. With great expectations, — U.M. Yes I thought that apology were quite interesting, But America will never pay reparations to Black American. We are not Jews, there is no sympathies for Black are Africans. Europeans believe that black were not human being Cure by the god of their bibles “NOAH HAM.” IT’S A LIE, But that is what they believe…. — J.G. …How can we fully express how slave trading, as it developed into the triangle trade in the Atlantic and elsewhere, was the most resource-intense human purpose for 3 Centuries. Even if you count wars…for 3 full centuries…the exploitation of people and their native resources was the main focus of organized human attention. I don’t think this can be overstated. We really need to get what it is we are recovering from. It relates to our future, not only as human beings with one another, but as humans responsible for the continuing devastation of our planet. Again, thanks for your good work, and for inviting feedback. I think your statement is great and so worthwhile. I am sure I am not alone in having our own thoughts about it; that’s the point really; your statement is stimulating…. — P. McD. I think you are on the right track, and education is so important. People learn more when there is a specific action to go along with a signature, especially when everyone is working together. Keep up the good work. Warm regards, and much appreciation, — J.W. This is the most touching message I have ever read on the internet…As a proud black person who…has studied slavery and the impact on blacks and whites, I know the majority of Black and White Americans do want to improve race relations. As we realize there is a great need for an apology for past crimes, we recognize it is even more important to consider reparations for those trying times. Reparations is the best way to facilitate racial healing. The all mighty question of what fair and reasonable reparations are will arise. and I must admit the answer was revealed to me by a proud white man who I know is my friend. He is dedicated to easing racial tensions just like the people who wrote this message and myself…I find it my duty to offer his remedy as a solution to solve our historical problem of lingering affects of slavery and racism. He explained it as the United States of America Truth and Reconciliation Process. I will forever be grateful to him for this and consider him my soul mate in searching for racial healing between our people. In the Spirit of Racial Healing. — B.P. Thank you for sending a copy of your work. I was very moved by it and by your efforts over many years…. I continue to hope and believe that our many small and big actions bring healing and progress. — G.L. I’m an African American Catholic male doing anti-racism work for the Catholic Peace Movement (www.paxchristiusa.org) and definitely will review and reflect on…this important endeavor that you have started. It’s to me being inline with some practical action steps that are relevant to HR 194 (Apology for Slavery & Jim Crow)…. [I am hopeful] this…will reap some benefit for dealing with the legacy of slavery and its aftermath effect on humanity in the United States toward the “Beloved Community” that Dr. King spoke about. …Your website [is]…something of important at this moment in history. I just wanted to say that what you are doing is great. This is needed and a very important document that you have created. I hope it goes far, reaching many consciousnesses. As a white person it meant a lot to me to read it. This apology is long overdue and I’m so glad you have taken the initiative to create this. thank you. thank you. thank you. This is beautiful and moving. Thank you, please add my name. — C.P. What you are doing is sacred, holy, fantastic, beautiful, needed, precious, stupendous, phenomenally significant, and I could go on. I am one of the cousins in the documentary “Traces of the Trade” so this speaks to me BIG TIME. …Thank you many times over. — H.F. Thank you for creating this beautiful, thoughtful, provocative document. I am proud to be a signer. — L.F. Many thanks for this wonderful document and the opportunity to sign it. Please do add my name to it. I am forwarding this to several other people including my family and friends of color. I noticed you are interested in feedback, including GA Williams the first African American President of the Western, MA. Veteran’s for Peace organization and Karen Hurd who was on the commission in Florence, MA. 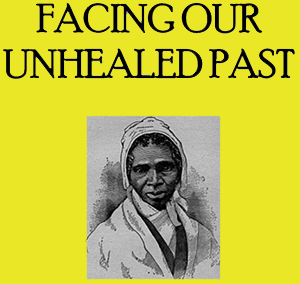 who created and chose the sculpture who created the Sojourner Truth statue in Florence, MA…. — K.
I am delighted to have the opportunity to sign this petition. Thank you for your commitment to this project to heal America. — J.P.M. Although I don’t live in Western Massachusetts, if possible, I’d like to sign this statement. I have been on a journey of racial reconciliation for the past three years after I recovered by accident that I descend from Rhode Island and Massachusetts slave holders and one Rhode Island slave trader. Incidently, one of my ancestors lit the torch that burned the Pequot village to the ground in Mystic, CT in the 1637. The few surviving Pequot men and boys were rounded up and sent off the West Indies and sold for enslaved Africans, who were put on the ship Desire, representing the first slaves in New England, arriving back in 1638… the current issue of New England Ancestors (published by the New England Historic Genealogical Society) has an article how I was able to locate and meet a living descendant of a man that had been enslaved by my family…. — D.P.